In this Division, we are looking for physiques with broad shoulders, broad back, narrow waist, well developed shoulders, arms, abs obliques with beautiful proportions. Good amount of muscle mass and size (as long as you don’t have thick waist) along with good conditioning and symmetry will be rewarded. If you bring a physique close to some of the Top well known Physique Competitors on the international circuit, you will be marked favorably. However, you can NOT BRING SIZE WITH THICK WAIST. A THICK WAIST WILL BE MARKED DOWN VERY HEAVILY REGARDLESS OF YOUR SIZE OR CONDITIONING. •	All Registrations for Juniors & Disabled Will need to be done Off Line. Please contact anyone from Boss Classic Team, and we will be more than glad to help you with the entire process. •	You will also be marked favorably for “Reasonable” Vascularity. If you are overly vascular, and have veins coming out of your entire body, in that case you will be marked down. •	Your Overall conditioning will also be marked favorably. •	Your upper leg development will be not be marked for scoring, since you will be posing in board shorts in the Compulsory Round. However you will be scored on your Calf Development. •	Your size can be an advantage, however your SIZE MUST BE ACCOMPANIED WITH EQUALLY GOOD PROPORTIONS. However, if you are way too big (especially if you look more like a body builder than a Physique competitor, especially if you have a THICK WAIST, THAT WILL GO AGAINST YOU IN SCORING. •	If you are selected in the Top 6 of your class, you WILL be required to do an individual Posing routine of 1 Minute or Under. •	In the Individual Posing Routine, you can do any kind of posing routine. However, we strongly recommend you NOT to hit any Body Building Poses, do any Flipping, Cart Wheels, Splits, Dancing or anything that is not usually seen at the International Level. •	If you do something that looks really silly in Judges eyes, you WILL be marked down for that. •	Best advice we can give you for Individual Posing Routine is, be creative with your posing, but keep it “Classy”. Also, try not to make too many hand movements or keep moving unnecessarily during your posing. •	You will be judged at ALL TIMES WHEN YOU ARE ON STAGE. What this means, even if you are standing at the back of the stage, the judges WILL BE WATCHING YOU. •	Please bring your Posing music in a CD & a USB. You will need to provide this to the backstage Marshalls, if you make it to the Final 5. •	None of the 7 Compulsory body building poses are allowed. You will be marked down if you hit any of the body building poses. •	QUARTER TO THE RIGHT AGAIN (Back Towards The Judges): Once the judges have finished judging you from the front, the Head Judge will call “QUARTER TURN TO THE RIGHT” – Once again, you can either have your 1 hand on your hip, or you can have both hands pointing downwards. Make sure you spread your lats well and are facing the back of the stage. Our advice to you would be is, practice your ability to spread your lats as well as you can. •	Posing Trunks for this category are your KNEE LENGTH SHORTS. •	Your shorts MUST NOT BE ANY LOWER THAN WHERE YOU CALF MUSCLES START. •	If your shorts cover your calves even a little bit – YOU “COULD BE” MARKED DOWN – as the judges won’t be able to see your calves properly. Our advice to you would be is, please pay close attention to the shorts you choose to wear. •	You will also be scored on your grooming, hair style, facial presentation, and over all presentation. 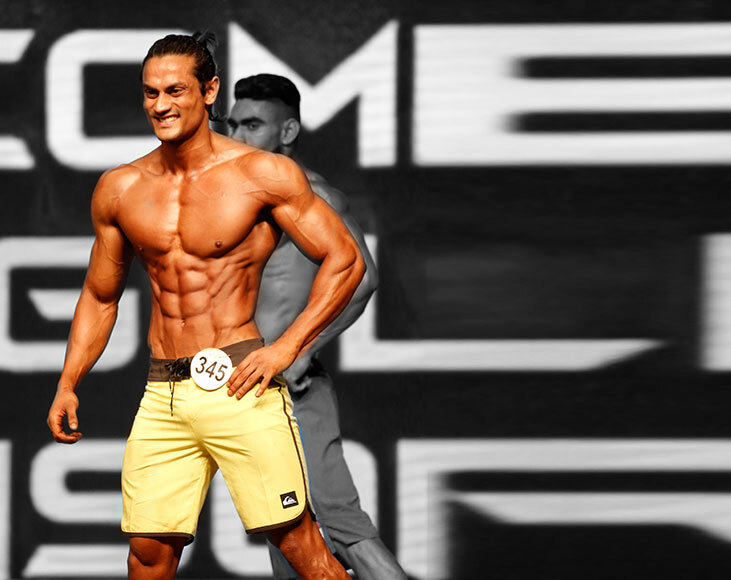 •	Whilst this will have very little impact if your physique is not up to mark, however if 2 competitors have scores tied, then the competitor with BETTER GROOMING, STAGE PRESENTATION AND POSING WILL BE MARKED MORE FAVORABLY. Our advice to you would be is, to focus equally well above on your Grooming, Stage Presentation & Posing as building your physique.